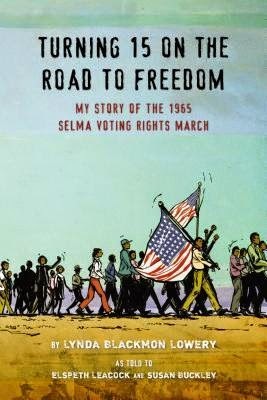 Turning 15 on the Road to Freedom: My Story of the 1965 Selma Voting Rights March by Lynda Blackmon Lowery with Elspeth Leacock and Susan Buckley, illustrated by PJ Loughran. Grades 6+. Dial, January 2015. Review copy provided by publisher. So begins Lynda Blackmon Lowery's story of growing up in the Jim Crow South and marching for justice. At a young age, Lynda got involved in the Civil Rights movement in her hometown of Selma, Alabama. Even after she and her friends were jailed for protesting, even being put inside the "sweatbox" where the airless heat was so intense that all the girls passed out, Lynda would not stop in her quest for equal rights. When organizers put together a march for voting rights in Selma, Lynda knew she would be part of it. And even when she was horribly beaten by state troopers in an event called "Bloody Sunday," Lynda knew that she needed to find the courage to keep going, to keep marching. Lynda was the youngest person in the 1965 Selma Voting Rights March. She stood up for what she believed in. And you can, too. This is an important first-person account of the 1965 Selma Voting Rights March. It's written in a conversational tone, as if Lynda's sitting across from you at the kitchen table and telling you about her experiences. Some archival photos and color illustrations accompany the text. The illustrations are well-suited to a teen audience, adding splashes of color throughout. At the back of the book, you get brief bios of some of the casualties of the Selma March - Jimmie Lee Jackson, a young man shot by police at a nighttime protest just prior to the march; Reverend James Reeb, a white minister from Boston who traveled to Selma after seeing Bloody Sunday on the news; and Viola Liuzzo, a white homemaker who was murdered by the KKK while driving folks between Selma and Montgomery after the march. The Oscar-nominated film Selma may pique additional interest in this topic. And hey, it's Nonfiction Monday! Head on over to the Nonfiction Monday Blog to see what other great nonfiction bloggers are sharing this week!